Hi all, this is my 1st time to drop my words here. The interesting part of this wheel is , it modified by Mr.Ma to improve his car (PEUGXXXT)performance. I was shocked because it was the 1st time i heard from human being to improve the car performance by using Solidworks. According to Mr.Ma, after he design and modified this car`s flywheel, he sent the part( flywheel ) and the drawing to the Machining shop to modify. ( After 20++ years of living,I only know if want to change your car setting or modify your car, you need to send your car to the car service centre or workshop only ). Mr.Ma told me that his new design concept was to make the flywheel become lighter. So, why lighter is better? 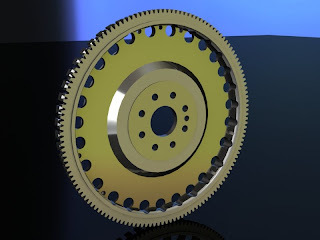 A lighter flywheel requires less energy to be moved, allowing more of the net total force produced by the engine to go to the wheels, making the car quicker (please refer to http://www.uucmotorwerks.com/flywheel/there_is_no_torque_loss.htm for more information). I feel very proud because Solidworks can help Mr.Ma to achieve what he need. 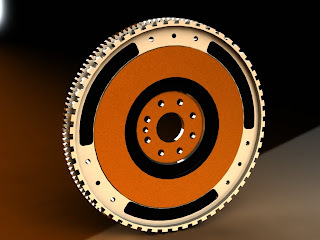 Solidworks helped in : 1) Design optimization. Of course, the most important thing here is solidworks can assist us to design the thing you desire. Just like Mr.Ma done for his wife (car) . I can foresee that solidworks will come nearer and nearer in our life....Do you agree that? i want to modify my car too... how much is the performance gain?